Hamilton got bogged down at the start, Ferrari appeared to have the race in hand, and the new Haas F1 team was in position to pick up a point. For a while 2016 Australian Grand Prix seemed to be a break from the last two seasons. But on lap 17 Alonso and Gutierrez collided, sending Gutierrez into the sand trap and Alonso barrel rolling and flipping into the wall. Alonso walked away with only a slight limp, but the race was red-flagged. The 2016 Formula One season starts this weekend in Australia, with Lewis Hamilton as the odds-on favorite to claim his fourth World Championship overall and third in a row. Mercedes has racked up nearly 1,300 laps over the winter practice, appearing to have finally put to bed the reliability gremlins which plagued them during the 2014 season. Ferrari, meanwhile, seems to have taken a big step forward in pace, and seeks to challenge Mercedes for the constructor's title. This year also sees the appearance of Haas F1, an American-owned team under the leadership of NASCAR team owner Gene Haas. Bolstered by an engine deal with Ferrari and a decidedly non-rookie lineup of Romain Grojean and (former Sauber driver and Ferrari reserve driver) Esteban Gutierrez, Haas has stated they plan to be fighting the mid-pack teams by the end of the year. This year also sees three new faces: Jolyon Palmer (Renault) and DTM Champion Pascal Wehrlein and GP2 Series regular Rio Haryanto (Manor). Let's check out the preseason standings. Our first look at the application of our Elo ratings for Formula One will examine the 2014 and 2015 seasons. These seasons were notable for the utter dominance by the Mercedes F1 team and their drivers, Lewis Hamilton (GBR) and Nico Rosberg (GER). 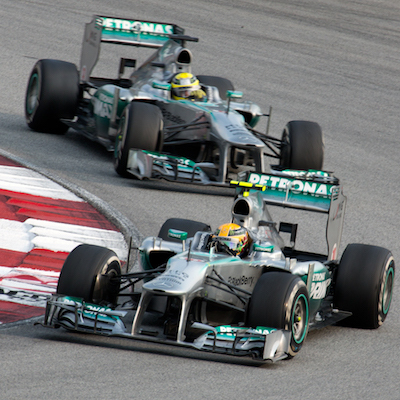 Hamilton leads Rosberg during the 2013 Malaysian GP. Hamilton won the title in 2008 while driving for the McLaren team, while Rosberg had routinely bested seven-time world champion Michael Schumacher while the two were teammates during Schumacher's return to F1 from 2010-2012. Hamilton and Rosberg had been friends since they were teenagers, teammates in the European Karting Championship. Even then they spoke of being teammates in Formula One, racing against each other for the World Championship. Mercedes gave them that opportunity. Hello from the 2016 Sloan Sports Analytics Conference. We're also excited this year to unveil our new Formula One coverage. (I've been a huge fan of F1 my whole life, so this is an exciting moment for me.) We've created an Elo rating system for F1 drivers going back to 1980. Want the definitive answer on Prost versus Senna? Senna versus Schumacher? The most dominant F1 season in the last 36 years? The drivers with the best peak career ratings? You'll find all of that plus up-to-date ratings for the current season. Over the last several years, Elo ratings have expanded beyond chess to become a popular framework for calculating power ratings for teams in the NBA and NFL, as well as international baseball, soccer, and hockey teams. Elo provides an excellent framework for initial analysis of teams or players, especially when the actual event has events, moves, or strategy which are difficult to quantify at a fine granularity. Some sports for which there are Elo ratings -- such as basketball and baseball -- have been analyzed in more detail, and we now have a better understanding of how to evaluate both teams and individuals. the same way Kristian Nairn says "Hodor" at work. However there are many sports -- notably hockey, soccer, and football -- which are more difficult to pick apart. Football and soccer have more players than basketball or baseball. Soccer and hockey don't really have solidly defined possessions in the same way as baseball or basketball. At a first approximation, the outcome of a game -- and its score -- are what we have to go on. This is where Elo comes in. I grew up in a Formula One household. This isn't something that's common to people in America. I work with many people who are originally from Europe and Asia, and most of them are surprised to find an American who's familiar with not just Prost and Senna, but Mansell, Lauda, Berger, Patrese, Alesi, Schumacher, Hill, Villeneuve, Hakkinen, Coulthard, and Barrichello. My dad has been a Formula One fan since before I was around, taking my mom to the 1975 British Grand Prix (Fittipaldi! Lauda! Andretti! Hunt!) during their post-college tour of Europe. When I was a kid, the fledgling sports network ESPN would show whatever programming they could get their hands on, including Formula One. Saturday mornings were qualifying and then cartoons, followed by race day on Sunday mornings. I remember watching Nigel Mansell's tire explode at the 1986 Australian Grand Prix, costing him a world championship that would elude him until his legendarily dominant 1992 season. I remember watching the controversial ending to the 1989 season, in which Prost appears to have chopped in front of Senna, taking both drivers out, thereby securing himself a world title. I remember watching Senna return the favor a year later.